Ambassador Heather Hodges to be png'ed but apparently "not officially expelled"
Reuters reported yesterday that Ecuador had declared the U.S. ambassador to the country "persona non grata," demanding that Ambassador Hodges leave the country over U.S. diplomatic cables released by Wikileaks reporting on alleged police corruption. This is the most serious form of censure that a country can apply to a representative of a foreign mission. In this case Ecuador had publicly indicated that Ambassador Hodges is no longer welcome in the country. "Ecuador's government has decided to consider this woman as a persona non grata... we have asked her to leave the country in the shortest time possible," he said. Patino also said that the decision did not mean Ecuador was breaking off relations with the United States. Reuters noted that Ecuador late last year had initially offered Wikileaks founder Julian Assange the possibility of working and seeking residency in the Andean country. But President Rafael Correa later withdrew the offer saying Assange had broken U.S. laws. The Latin American Herald Tribune said that the offending cables were about corruption in the South American country's police force and noted that Ecuador had previously expelled two American diplomats -- including First Secretary Mark Sullivan -- in February 2009 for "unacceptable interference in Ecuador's internal affairs." The Tribune also pointed out that in July 2008, Ecuador President Rafael Correa also refused to renew a 10 year lease on a U.S. air base in the Ecuadorean port city of Manta, which the U.S. used to conduct anti-drug surveillance in the region. The U.S. left the Manta air base in September 2009. CNN reported that Ecuador's foreign minister, Ricardo Patino, said that although the government is asking the ambassador to leave, she is not being officially expelled. This act "is not against the government of the United States, but against a diplomat who made serious statements," Patino said. Funny thing about this -- the Ecuadorian Foreign Minister called the ambassador "this woman as a persona non grata" -- she may have been the signoff signature on those offending cables, but most probably did not write up those reports. That's what note takers are for, silly. But that probably doesn't really matter to the host country. Somebody's gotta pay, not for reporting something that may/may not be known to the locals .... somebody's gotta pay for the dirty laundry now out in the open. What "serious statements" were actually said in those Embassy Quito cables that so upset the Government of Ecuador? For starters, a February 2009 cable, reported a background to President Correa's attacks on U.S. cooperation with Ecuador's Police including that tinsy winsy bit about Government of Ecuador officials were linked to the FARC. That's the Revolutionary Armed Forces of Colombia, the largest and oldest insurgent group in the Americas. You can read the cable here, published by El Pais. The other cable from July 2009 that appears to put some ants inside the official pants is this cable --a Visas Donkey cable on Corruption 212(f) Visa Revocation of Jaime Aquilino Hurtado Vaca. Hurtado is the Commander of the National Police. The cable also includes Hurtado's wife and daughter. You can read the cable here published by El Pais detailing the corruption. These two cables alone will give you an idea why somebody's gotta pay. If you kick out the US ambassador, maybe that would beat out the dirty laundry headlines. But you can't wash the dirty laundry in the dark, can you? Quick bio: Heather Hodges was sworn in at the Department of State as U.S. Ambassador to Ecuador on July 15, 2008, arrived in Ecuador in early August, and presented her credentials to President Rafael Correa on October 2, 2008. Prior to this appointment she was Principal Deputy Assistant Secretary in the Office of the Director General. She served as U.S. Ambassador to Moldova from September 2003 to May 2006. Ambassador Hodges joined the Foreign Service in 1980 and was assigned to Caracas, Venezuela. Following Caracas, she served in Guatemala and later in Washington as Peru Desk Officer. In 1987, Ms. Hodges received a Pearson Fellowship to work in the U.S. Congress, where she was counsel to the Senate Subcommittee on Immigration and Refugee Affairs. In January 1989, she became Consul General at the U.S. Consulate in Bilbao, Spain. In 1991, she returned to Washington to serve as Deputy Director of the Office of Cuban Affairs. In 1993, Ms. Hodges was assigned to Managua, Nicaragua, as Deputy Chief of Mission. From August 1996 to June 1997, Ms. Hodges participated in the Department of State's Senior Seminar, a leadership program for select members of the Foreign Service. 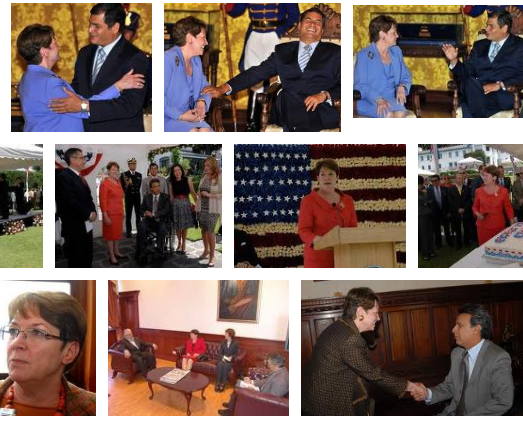 She served as the Deputy Chief of Mission in Lima, Peru, from July 1997 to May 2000 and was also Deputy Chief of Mission at the U.S. Embassy in Madrid, Spain, from June 2000 to July 2003. Before she left Spain, the Spanish government awarded Ms. Hodges the Spanish decoration of “Isabel la Catolica – Encomienda de Numero” for her contributions to Spanish-U.S. relations. Similarly, the Government of Moldova presented her with the Award of Honor in 2006, and the same year she was awarded a Presidential Meritorious Service Award. Ambassador Hodges is a native of Cleveland, Ohio. She has a B.A. in Spanish from the College of St. Catherine, in St. Paul, Minnesota, and an M.A. from New York University and speaks fluent Spanish.